Heading off to college? Or perhaps already there? This book's just for you. 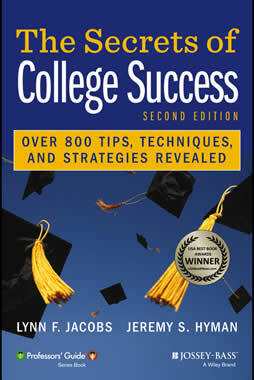 Winner of the 2010 USA Book News Award for best book in the college category, The Secrets of College Success combines easy-to-follow tips that really work with insider information that few professors are willing to revealâ€”but all students need to know. Match college and career, and more. Taking out student loans and paying them off, and more. Ideal for college students at any stage, and college-bound high school students, The Secrets of College Success makes a wonderful back-to-college or high-school-graduation giftâ€”or a smart investment in your own future.